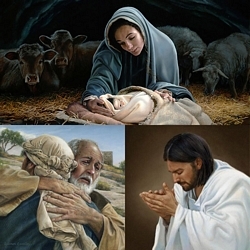 Image Size: 12"w x 10"h.
The artistic power of Liz Lemon Swindle’s emotionally charged image rests in the father’s face and the intense grasp of his hands. The true spiritual intensity evident in the father’s embrace of his wayward son represents God’s unconditional love for us. As found in all of her paintings, Swindle’s detail for humanity is channeled through the image and to her collector. One is hard pressed to find any difference between the emotion and relevance of such a scene then and one that happens today, 2000 years later. "The Prodigal Son" is a reminder of God’s amazing ability to forgive and restore us and of the human need for family and grace.